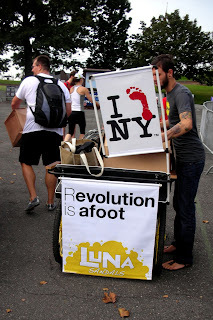 Since I took the photos, and told you all I was going, it would make sense that I write up my experience of the 2nd Annual NYC Barefoot Run for you all, even if it is a bit late. This post might start out a bit uneventful, but keep reading on because I'm saving the highlight of the day -- when I got to meet a very special barefoot blogger -- for the very end. I had the most wonderful time in the world. "We have access to a building on Governors Island that is just off the ferry. If it’s raining hard, we will set up the run out of that building ..."
"After getting set up indoors, we will make a go at a run in the rain. Afterwards, people can return indoors." 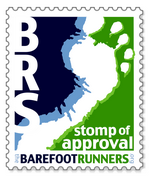 To a fair-weather barefoot-runner such as myself, this did not sound very appealing at all. Every time I imagined what it would be like in that building after running in the rain with all those wet sweaty barefoot runners, I thought "ugh!" Yet, to not do it would be to miss out on the gathering of like-minded souls. And it would also mean I would not get to meet one of my barefoot blogging heroes, whom I had been so looking forward to meeting. Waking up Sunday morning, however, it was not looking too bad. 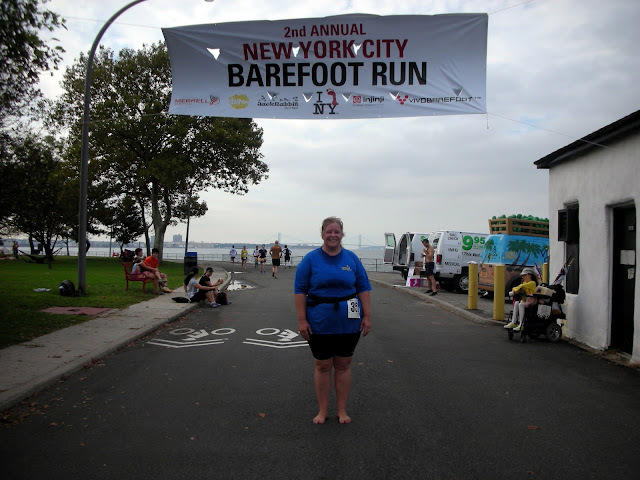 Unlike last year, at the 1st Annual NYC Barefoot Run, I did not have any companions joining me. I had to make my way over by myself. I decided to try driving in, because I wasn't sure if the buses were going to be running regularly on an early Sunday morning. 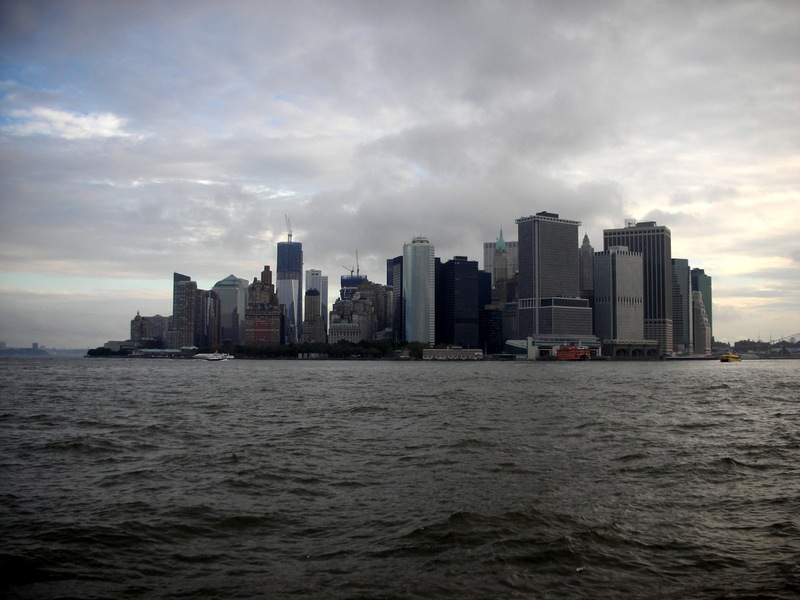 I was very nervous about parking, and when I got to a certain point on the West Side highway, the police redirected traffic through Manhattan. This little detour made me a bit late. So, I caught the last ferry going over to the island. Amidst the air of celebrity -- whom I think the organizers were referring to as "the Kudus" at this event -- I felt like a very small and insignificant barefoot runner. So, I felt a little more useful when asked to help carry some boxes coming off the ferry. (See in the photo, the guy with the backpack carrying the box. He, like me, was a Box-Carrier. Boxes got loaded on to the little rickshaw). It made me feel a little more important! 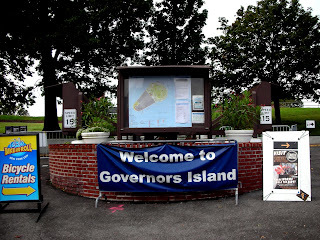 Next was the 15- minute walk over to the part of the island where the race was going to start. I remember how last year I was all worried about an extra 15 minutes of walking, since I was trying to save myself so I could run twice around the island. It felt good to know that 15 minutes of walking was nothing this year and would not take away from running (even though I was only planning to run one time around, about two miles). This year we were delighted and surprised to kick things off with some beautiful singing -- the singing of The National Anthem by a barefoot-running singer named Melissa. (If you are on Facebook, you will be able to hear her singing by clicking on the link.) 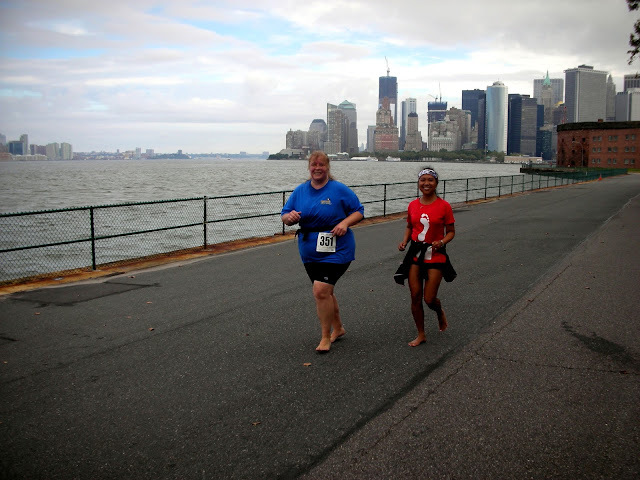 Melissa had been the sweeper, who had so kindly run alongside me at the "Born to Run" Barefoot Run I had attended summer of 2010 when I was first starting out as a barefoot runner. I had learned since then that she was a singer, but now I got to hear her for the first time and it was a thrill to hear her beautiful mezzo voice. It was really cool to have such a professional kick-off to the event. After allowing a couple who got engaged at the event to head out first in the Luna Rickshaw that was being pulled by Barefoot Ted, we all set out on our merry barefoot way. As I started out, John Durant, who is the co-founder of the Barefoot Runners New York City Meetup group, fell in step alongside me. What did we talk about? Why, the weather of course. How happy we were that it did not rain after all. I think he left me with the deep philosophical reflection on the fact that when they say 60% chance of rain we always forget that there is a 40% chance that it will not rain. He is always a very profound guy. Now, John Durant was very kind to run at my very slow pace for a bit, but I am sure that he could not have continued at that pace forever (nor continue to come up with profound weather statements for much longer). He needed to get up to speed and head on his way. Nevertheless, despite how slowly he may have felt he had been running, it was a little bit faster than I usually run. Due to that fact -- having set a bit faster pace -- I actually found it a little hard to get around the island for the two-mile run I had planned. Remember, I have not trained that much this summer, so I haven't got much more than 2 miles in me at this given point in time. As I struggled along, kind of thinking that I might need to stop and walk, which I actually did for a few paces, I spied ahead of me on the path someone who was running a little more slowly than I was (not too many of those out there). As I was about to pass her, I realized that she was running more at the pace I am accustomed to using, and that I would be better off slowing down to her pace. At one point, back there by that little brown building, my contact lens fell out. I had a really tough time with sweaty hands and the wind, trying to get it back into my eye. Marilyn and John were really nice and stood blocking the wind for me. After several attempts, I managed to get the contact lens back in my eye. Okay, so the run part was over. Now the highlight of my whole day occurred. 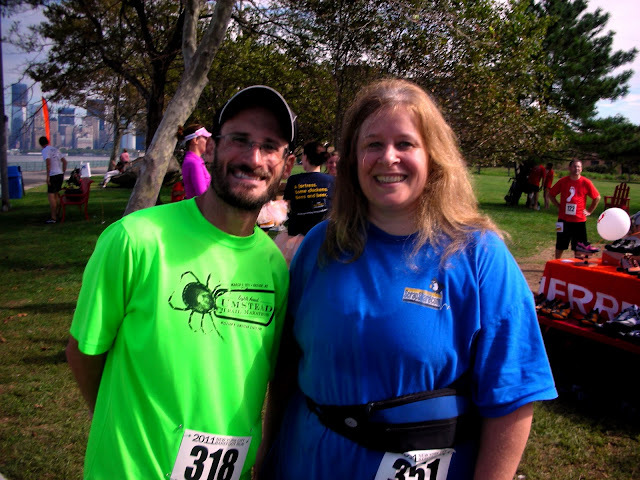 I finally met fellow blogger and barefoot-running mentor, Barefoot Josh. I felt like I knew him already because he is exactly like he seems on his blog. I love the fact that even though Josh is a very fast barefoot runner, he makes no judgments and condescends to help the struggling poor little ones find their way into the world of barefoot running. We had a great, although too short, little chat, and I left that day thinking that as fun as it is to merely go out running barefoot, it is also great fun to meet other people who like to run barefoot too. Thanks for posting this account! You sure have come a long way in a year! Sorry for the late comment - I thought I had already, but must have imagined it. It was my honor to meet you! I think another reason we felt like we knew each other is that we share a "why the hell not" attitude. It was cool to talk to you like we had been hanging out for years.